Does the Amazon jungle conceal a vanished empire? In 1925, the legendary British explorer Percy Harrison Fawcett ventured into the Amazon, vowing to make one of the most important archeological discoveries in history. He was searching for an ancient civilization, which he had named, simply, the City of Z. Ever since the Spanish conquistadores descended the Amazon River, in 1542, perhaps no region on the planet had so ignited the imagination - or lured so many men to their death. For centuries, the conquistadores had searched the jungle for the glittering kingdom of El Dorado. The kingdom, which the conquistadores had heard about from Indians, was said to be so plentiful in gold that its inhabitants ground the metal into powder and blew it through "hollow canes upon their naked bodies." (El Dorado literally means the Gilded Man.) Thousands had died looking for this golden realm. Yet after a toll of suffering and death worthy of Joseph Conrad, most archeologists had concluded that El Dorado was no more than an illusion. Many modern scientists have assumed that no complex civilization could have emerged in so hostile an environment, where the soil is agriculturally poor, mosquitoes transport lethal diseases, and predators lurk amid the forest canopy. The Amazon's brutal conditions have fueled one of the most enduring theories of human development: environmental determinism. According to this theory, even if some early humans eked out an existence in the harshest conditions on the planet, they rarely advanced beyond a few primitive tribes. Society, in other words, is a captive of geography. probably more, highly advanced civilizations. He was the last of a breed of explorers to venture into blank spots on the map with little more than a machete, a compass, and an almost divine sense of purpose, and he spent nearly two decades gathering evidence to prove his case and pinpointing a location. With his 21-year-old son, Jack, and Jack's best friend, Raleigh Rimell, Fawcett finally set off into the Brazilian jungle to find the City of Z. Then he and his party vanished, giving rise to what has been described as "the greatest exploration mystery of the 20th century." Fawcett had warned that no one should follow in his wake due to the danger, but scores of scientists, explorers, and adventurers plunged into the wilderness, determined to recover the Fawcett party, alive or dead, and to return with proof of Z. In February 1955, the New York Times claimed that Fawcett's disappearance had set off more searches "than those launched through the centuries to find the fabulous El Dorado." Some were wiped out by starvation and disease, or retreated in despair; others were murdered by tribesmen firing arrows dipped in poison. Then there were those adventurers who had gone to find Fawcett and, like him, simply disappeared in the forests that travelers had long ago christened the "green hell." History has been as unsparing of Fawcett as was the jungle. Although his legend helped inspire Arthur Conan Doyle's novel "The Lost World" and once spawned radio plays, poems, documentaries, movies, stamps, children's stories, comic books, ballads, stage plays, and graphic novels, Fawcett has increasingly been forgotten. Most scholars have dismissed him as a crank who sacrificed his life, and that of his son, in pursuit of a mad fantasy. Yet in recent years archeologists have begun to find evidence of what Fawcett had always claimed: ancient ruins buried deep in the Amazon, in places ranging from the Bolivian flood plains to the Brazilian forests. These ruins include enormous man-made earth mounds, plazas, geometrically aligned causeways, bridges, elaborately engineered canal systems, and even an apparent astronomical observatory tower made of huge granite rocks that has been dubbed "the Stonehenge of the Amazon." The discoveries are not only transforming our understanding of one of the most daring and eccentric explorers ever to set foot in the New World. They are challenging long-held assumptions about the Amazon as a Hobbesian place where only small primitive tribes could ever have existed, and about the limits the environment placed on the rise of early civilizations. And these revelations are exploding our perceptions of what the Americas really looked liked before the arrival of Christopher Columbus. The idea did not strike Fawcett like a bolt of lightning. Rather, the theory of Z developed over time, with one clue leading to the next. Fawcett, who was born during the Victorian age of exploration, had trained as a surveyor at the Royal Geographical Society in London, the same place that had helped launch such explorers as Richard Burton and David Livingstone. 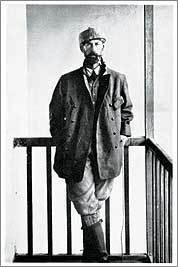 In 1906, after serving as a British secret agent in Africa, Fawcett had been recruited by Bolivia, Brazil, and Peru to map the interior of the Amazon. The region was still so unexplored that these countries could not even agree on their borders: They were simply speculative lines sketched through forests and mountains. It was during these epic journeys - journeys in which many of his men perished from disease and starvation - that Fawcett began to gather evidence of Z. Over a span of nearly two decades, he made contact with various unknown tribes, documenting how they had brilliantly adapted to the conditions in the jungle. They often used the Amazonian flood plains, which were more fertile than terra firma, to grow crops, and relied on elaborate ways of hunting and fishing. As a result, they were able to generate enough food to sustain larger populations - a precursor to any sort of complex society with divisions of labor and political hierarchies such as chiefdoms and kingdoms. "Food problems never bothered them," Fawcett said. Fawcett also studied the 16th- and 17th-century chronicles of the El Dorado hunters. Even though the conquistadores had not found a golden kingdom, they had reported seeing "cities that glistened in white," with temples, public squares, palisade walls, causeways, and exquisite artifacts. Because later explorers never came across similar settlements - or indeed any large populations - it was assumed these descriptions, like El Dorado itself, were simply products of the conquistadores' fervid imaginations. But once while Fawcett was climbing a desolate mound of earth above the flood plains of the Bolivian Amazon, he noticed something sticking out of the ground. He scooped it into his hand: it was a shard of pottery. He started to scour the soil. Virtually everywhere he scratched, he later wrote, he turned up bits of ancient, brittle pottery. He thought the craftsmanship was as refined as anything from ancient Greece or Rome or China. "Wherever there are 'alturas,' that is high ground above the plains" in the Amazon basin, Fawcett said, "there are artifacts." And that wasn't all: extending between these alturas, there appeared to be some sort of geometrically aligned paths. They looked, he could swear, like "roads" and "causeways." Still, Fawcett struggled to make sense of his own findings. The notion of a complex civilization in the Amazon contradicted the two ethnological paradigms that had prevailed since the first encounter between Europeans and Native Americans, more than 400 years earlier. Though some of the first conquistadores were in awe of the civilizations that Native Americans had developed, many theologians debated whether these dark-skinned, scantily clad peoples were, in fact, human; for how could the descendants of Adam and Eve have wandered so far, and how could the biblical prophets have been ignorant of them? In the mid-16th century, Juan Ginés de Sepúlveda, one of the Holy Roman Emperor's chaplains, argued that the Indians were "half men" who should be treated as natural slaves. At the time, the most forceful critic of this genocidal paradigm was Bartolomé de Las Casas, a Dominican friar who had traveled throughout the Americas. In a famous debate with Sepúlveda and in a series of treatises, Las Casas tried to prove, once and for all, that Indians were equal humans ("Are these not men? Do they not have rational souls? "), and to condemn those "pretending to be Christians" who "wiped them from the face of the earth." In the process, however, he contributed to a conception of the Indians that became an equal staple of European ethnology: the "noble" savage. According to Las Casas, the Indians were "the simplest people in the world," "without malice or guile," who are "totally uninterested in worldly power." Although in Fawcett's era both conceptions remained popular in scholarly and popular literature, they were now filtered through a radical new scientific theory on the origins of humankind: evolution. Victorians now attempted to make sense of human diversity not in theological terms but in biological ones. A popular anthropology manual, which Fawcett studied, included chapters on "Anatomy and Physiology," "Hair," "Colour," Odour," "Physical Powers," "Senses," and "Heredity." The Victorians wanted to know, in effect, why some apes had evolved into English gentlemen and why some hadn't. Fawcett was deeply influenced by such racist ideas; his writings are rife with images of Indians as "jolly children" and "ape-like" savages. And he constantly struggled to reconcile what he saw with everything he had been taught. The only thing he was certain of was that the Amazon and its people were not what everyone assumed them to be. Too much evidence indicated that the jungle had once been the center of a great civilization. After Fawcett disappeared, many scientists no longer doubted his theory on biological grounds. The Aztecs in Mexico and the Incas in Peru had obviously produced extraordinary cities, disproving any notion that Native Americans were somehow "half men" physically incapable of such feats. Instead, many scholars assumed that the Amazon jungle was simply too inhospitable to sustain a sophisticated society. Biological determinism had increasingly given way to environmental determinism. And the Amazon - the great "counterfeit paradise," as the archeologist Betty Meggers famously coined it - was the most vivid proof of the Malthusian limits that the environment placed on civilizations. And then slowly it began to happen. After many archeologists had ignored the Amazon, assuming nothing of import would be found, a small group of revisionist scholars started to visit the region. Unlike their predecessors, they were often aided by an array of sophisticated tools, including ground-penetrating radar, satellite imagery to map sites, and remote sensors that can pinpoint buried artifacts. And what they found, in the words of one archeologist, was "earth shattering." In the last few years, a team of researchers led by the archeologist Michael Heckenberger uncovered 20 pre-Columbian settlements in the Xingu region of the southern basin of the Amazon - the very region where Fawcett believed he would find the City of Z and where he disappeared. These settlements, which were occupied roughly between 800 and 1600 AD, included houses and moats and palisade walls. There were causeways and roads, which connected the settlements together. There were plazas laid out along cardinal points, from east to west, and roads positioned at the same geometric angles. (Fawcett had reported that Indians told him legends that described "many streets set at right angles to one another." ) According to the scientists, each cluster of settlements contained anywhere from 2,000 to 5,000 people, which means that the larger communities were the size of many medieval European cities. "These people had a cultural aesthetic of monumentality," Heckenberger said. "They liked to have beautiful roads and plazas and bridges." Other scientists are fueling this revolution in archeology, which is upending the view of the Amazon as a place that could never sustain what Fawcett had envisioned: a prosperous, glorious civilization. Anna Roosevelt, a great-granddaughter of Theodore Roosevelt, who is an archeologist at the University of Illinois, has uncovered in a cave near Santarém, in the Brazilian Amazon, the remains of a settlement at least 10,000 years old - about twice as old as scientists had estimated the human presence in the Amazon. The settlement is so ancient that it undercuts the long-held theory that the Americas were first populated by the Clovis people, who crossed the Bering Strait from Asia at the end of the Ice Age, settled in North America around 11,000 years ago, and then gradually migrated down to Central and South America. In the cave and at a nearby riverbank settlement, Roosevelt made another astonishing discovery: pottery that dates to 7,500 years ago, predating by more than 2,000 years the earliest pottery found in the Andes or Mesoamerica. This means that the Amazon may have been the earliest ceramic-producing region in all the Americas, and that, as Fawcett radically argued, the region was possibly even a wellspring of South American civilization - that an advanced culture had spread outward, rather than vice versa. Using aerial photography and satellite imaging, scientists have also begun to find enormous man-made earth mounds and causeways across the Amazon - in particular in the Bolivian flood plains where Fawcett first found his shards of pottery. Clark Erickson, an anthropologist from the University of Pennsylvania who has studied these earthworks in Bolivia, says that the mounds allowed the Indians to continue farming during seasonal floods. To create them, he said, required extraordinary labor and engineering: tons of soil had to be transported, the course of rivers altered, canals excavated, and interconnecting roadways and settlements built. In many ways, he said, the mounds "rival the Egyptian pyramids." Some scientists now believe the rain forest may have sustained millions of people. And for the first time scholars are reevaluating the El Dorado chronicles that Fawcett used to piece together his theory of Z. Though no one has found evidence of the fantastical gold that the conquistadores had dreamed of, the anthropologist Neil Whitehead said, "With some caveats, El Dorado really did exist." These scholars say they are just beginning the process of understanding this ancient world - and, like the theory of who first populated the Americas, all the traditional paradigms must be reevaluated. "Anthropologists," Heckenberger said, "made the mistake of coming into the Amazon in the 20th century and seeing only small tribes and saying, 'Well, that's all there is.' The problem is that, by then, many Indian populations had already been wiped out by what was essentially a holocaust from European contact. That's why the first Europeans in the Amazon described such massive settlements that, later, no one could ever find." Fawcett often complained about his many detractors, about the "men of science" who had "in their day pooh-poohed the existence of the Americas - and, later, the idea of Herculaneum, Pompeii, and Troy." He spoke of his vision of a majestic culture rising in the Amazon and radiating outward, before being finally overwhelmed and swallowed by the lianas and creepers and palms. And in his final letter, which was carried out of the jungle by an Indian runner before he vanished, Fawcett assured his wife: "You need have no fear of any failure." David Grann, a staff writer at The New Yorker, is the author of "The Lost City of Z," from which this article is adapted. He will give a free lecture at the Museum of Science at 7 p.m. Wednesday. For more information: mos.org/adults.